You can use Files Go to search for apps that you installed but are not using anymore. With a few clicks you can uninstall these apps to free up space on your Android device and make it speedy. Another way to clear up space on your Android device is by deleting spam and duplicate files. Files Go can do this using a built-in feature that lets you easily remove duplicates such as documents, videos, and images, and even large files. 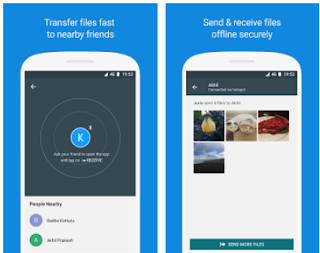 Similar to AirDrop, Files Go allows you to share files with other nearby devices that have the app installed. Sharing works through bluetooth connection. To help you better manage your files, Files Go arranges your files into categories such as ‘downloads, apps, images, videos, audio, and documents’ making it super easy for you to quickly browse and find files. Files can also be organized by size, name and date modified. To learn more Files Go, check out this post from MakeUseof.